the 100th anniversary2 of the word ‘appendicitis’ (inflammation of the appendix) being used in the surgical literature. Acute appendicitis, although on the decline again, still looms large in the everyday life of a surgeon. It is still by far the commonest cause of a patient presenting with an acute abdomen. Although the results of treatment have improved dramatically in the past 75 years, generally reflecting the great advances surgery has made in that time, there is still a morbidity and mortality that cannot be considered insignificant.2,3,4 The present decline in incidence of the disease is possibly due to recent improvements in the previously deteriorating diet of Western civilisation (Rendle Short,5 Burkitt6). The appendix is commonly referred to as a classic example of a vestigial organ. Such a statement implies that the appendix represents a vestige of an organ with a former greater existence in the evolutionary sense, rather than in an earlier stage of its development. It was because of Charles Darwin’s ‘Descent of Man’ (1871)11 in fact, that the vermiform caecal appendage became widely regarded as a rudimentary organ representing the much more developed distal caecum present (if evolution is assumed) in man’s more herbivorous ancestors. inferring the appendix is a rudiment in man on account of its small size and variability! In thus making his comparison, he thus assumed evolution to explain the interpreted regression, but later argued that it was this regression that was later good evidence for evolution—a circular argument. such an interpreted regression was inheritable, that is, successive generations acquire the characteristic of a smaller and smaller caecum and appendix and transmit this characteristic to their offspring. This type of inheritance, or should we say disinheritance, according to disuse is distinctively Lamarckian (even admitted by Ruse12 in his ‘Darwinism Defended’, p. 43) and such a mode of inheritance has long been discarded as it contradicts our basic understandings of Mendelian genetics. After Darwin said the appendix was vestigial and useless, he and others went on to suggest it was more susceptible to disease. This propensity for the appendix to be diseased, and possibly dangerously so (‘Descent of Man’, p.27), is in no way due to the organ having a lowered vitality and tending towards an atrophic (wasted) defenceless state, but simply a consequence of one of its functions placing it in the body’s front-line in the battle against infection. Akin to the tonsil guarding the upper alimentary tract from bacteria etc., so does the appendix guard the entrance from the almost sterile ileum into the normally bacteria-infested colon (see Fig. 1). Figure 1. Sketch of the human vermiform appendix and its location at the apex of the caecum below the entrance of the ileum. Later still, Darwinists suggested the ready dispensability of the appendix proved its uselessness. This type of logic would have a daughter believing her mother’s womb was useless if her mother was unaffected after a hysterectomy in later life for a disease of the uterus. Present day histology textbooks are starting to acknowledge that the appendix with its complicated and rich blood supply and marked tissue differentiation is a complex and highly specialised organ. Of course, the histological appearance of the appendix has been exactly the same all the time, but people are now starting to look at it from a different perspective. The most recent edition of ‘Gray’s Anatomy’9 indicates in its embryology section that the appendix is a vestigial remnant indicative of man’s ancestors’ more herbivorous dietary habits, whereas the anatomical section says, ‘In view of its rich blood supply and histological differentiation, the vermiform appendix is probably more correctly regarded as a specialised than as a degenerate, vestigial structure. The configuration of the caecum and appendix in man and the anthropoid apes, is probably less primitive than in the monkeys.’9 Surely one can’t have it both ways! From what has been said so far it can be seen that whereas in the past it was considered the appendix was becoming vestigial (involution with evolution), it is now generally accepted that the appendix is a highly specialised, well-differentiated organ apparently developed to the maximum in its specialisation in man. A careful examination and comparison of aspects of digestion in several kinds of animal is now in order. The rabbit gains amino acid nitrogen and other nutriments from the bacteria which digest the cellulose from grass etc. in its large caecum. The rabbit passes two types of stool; the one which is mucus-coated the rabbit eats (coprophagy), recycling it through the intestine to allow for absorption of the bacteriolytic products of grass digestion. Few animals would eat more grass than a rabbit, yet although it has a very large caecum acting as a fermentation tank, it also has a sizeable and distinctive appendix containing lymphoid aggregations in its wall. With cleft hooves, the ruminants such as cows, sheep and goats have a four-chambered stomach and gain many of their nutriments from the bacteriolytic digestion of cellulose in the rumen chamber of their stomach after regurgitation many times to improve the mix-chewing the cud. The ruminant digestive mechanism also allows for some recycling of urea into the saliva for bacteria to utilise, as well as the bacteria converting the plant cell amino acids into its own type which are more akin to what the cow, for example, requires. These animals have a seizable caecum for additional bacterial fermentation to occur, but no appendix. The horse has a more human-like stomach and gains nourishment by absorbing similar by-products of the bacteriolytic digestion of cellulose, as do most herbivores possessing such cellulase-producing bacteria in their gut. But the main absorption site of such products in the horse is through its very coiled and redundant caecum and colon. Once again the bacteria convert plant amino acids etc. to the preferred animal types. However, the horse does not have an appendix. Dogs and cats favour a mixed-to-carnivorous diet (or CAN-ivorous in domestication!) and obtain most of their nourishment from absorption of products of food digestion by their own small bowel juices, not unlike man. They have a bigger caecum than man where some bacterial fermentation occurs, but no appendix. Whether so-called ‘New World’, or ‘Old World’, monkeys do not have an appendix. Eating more nutritious food, such as fruit and nuts, their digestion is aided to a greater degree by their own digestive juices, so that more absorption occurs higher in the alimentary canal. They have a caecum which is not terribly big, so it has been compared to the embryonic stage of the developing human caecum and appendix unit. But of course, if we were to follow this line of argument, we would have to say the appendix, rather than becoming rudimentary and disappearing, is appearing and developing as we ascend the supposed evolutionary scale. This raises other difficulties. The anthropoid apes (gibbon, orangutan, chimpanzee and gorilla) and man also have a small caecum but with a distinctive terminal appendix (see Fig. 1). Although they eat a mixed diet, they are predominantly herbivorous, but the bacteria in their caeca do not secrete cellulase. the necessary enzyme for cellulose degradation and digestion. Nourishment is mainly from the absorption of food breakdown-products resulting from their own digestive-juice actions in the small intestine not dissimilar from digestion and absorption which occurs in monkeys, cats and dogs. Thus considering the digestive processes and absorption areas in several representatives of the animal kingdom, we see similarities and differences—mosaicism18,19 in the use of plan and purpose among animal kinds and discontinuity between animal kinds. The appendix, as a distinctive organ separate from the caecum, has been present and absent among the above examples. Taking any evolutionary tree an evolutionist cares to suggest, and trying to correlate the appearance and disappearance of the appendix with such a tree, is impossible. A typical defence is either to argue that soft parts don’t fossilise and things must have been different in the past (evolutionists then ignoring their cherished axiom ‘The present is the key to the past’), or calling upon ‘convergent evolution’, which is a type of explain-anything phrase without mechanism that is frequently used to defy the above obvious type of mosaicism. If formerly the evolutionist had the appendix going and now has it coming, he cannot explain why it is first present in some marsupial animals like the wombat, but absent in all the mammals between the wombat and apes and man, apart from the rabbit and a few rodents, and especially explaining the absence in monkeys. Evolutionary postulations would have us believe that a tailed mammal without an appendix gave rise to a monkey with a tail but still without an appendix, which then gave rise to an ape without a tail but with an appendix, and then on to man where the appendix has developed to the extreme! Although an oversimplification, the above exemplifies the incredible problem the evolutionist now has with his supposedly vestigial appendix. With one argument he has us believing it’s going and with the other it’s coming. Perhaps it is neither going nor coming. The fiat creationist would expect various kinds of animals to have alimentary tracts based on a common design, with modifications and specialisations on that basic blueprint being made in appropriate areas.19 Such alterations would still be according to plan and purpose, and conforming to the structural and functional needs of the organism in question in its natural environment. The organism would also have an inbuilt ability to adapt within a fixed range to allow for growth to maturity and adjustment to environmental variations. The caecum and appendix, when viewed as separate but related specialised entities in structure and function in the digestive tracts of different animal kinds, do not contradict creationist expectations. During the fifth foetal week it is the appendix which develops from a bud at the junction of the small and large bowel and undergoes rapid growth into a pouch. In the sixth week there is a transient nubbin surmounting the pouch indicative of being involved in the rapid development of the pouch which is very strategically placed near the apex of the highly significant mid-gut loop. It is only after the fifth foetal month that the proximal end of this pouch, which has appeared to be a very insignificant structure up until this stage, starts growing differentially to give rise to the true caecum which continues to develop into infancy. The embryonic appendix has finger-like projections (villi) on its inside surface and it is only around birth that the long ribbons (taeniae) causing the sacculation of the large bowel start to develop. These ribbons, of course, converge on the base of the appendix. The goblet cells lining the appendix and adjacent caecum and colon secrete a special type of mucus which can be regarded as an antibacterial paint controlling the organisms which develop in the bowel in the region. The paint contains a high concentration of IgA type immunoglobulins, secretory antibodies produced for mucosal or surface immunity and part of the bowel-blood barrier . Through the cells within and overlying the lymphoid follicles and their production of secretory and humoral antibodies the appendix would be involved in the control of which essential bacteria come to reside in the caecum and colon in neonatal life. As well it would be involved in the development of systemic tolerance to certain antigenic agents within the alimentary tract whether they are derived from bacteria, foodstuffs or even the body’s own proteolytic enzymes. One in three hundred or so appendectomy specimens contains a carcinoid tumour composed of a highly specialised type of cell rich in vaso-active peptides such as serotonin. The exact function of such agents in the entire bowel is still being elucidated, but the fact that the majority4 of such tumours occur within the appendix is indicative that the appendix could well be involved in some way with such substances. IgM and IgG immunoglobulins for humoral or bloodstream immunity. These results have been in rabbits, and the rabbit appendix is not exactly the same as the human. Studies of the functions of the human appendix, however, have tended to concentrate on extrapolating across from animal models where it is difficult to escape evolutionary overtones and possibly repeating the errors Darwin made when using homology. Other studies on the human appendix have tended to concentrate on tissue from young adults when the appendix has probably completed its major role. Recently the topography14 of immune cells and their products in the appendix have been described both in the presence and absence of acute inflammation, as well as it becoming evident that lymphocytes individually move into the appendix between the tenth and twentieth foetal week.14 Such studies have also highlighted the mode of immune cell reactions both with each other and other cells in the area in a detail not known before and quite significant advances have been made. Of course, lymphoid follicles do not actually appear as such in the appendix until two weeks after birth4 at the same time that colonisation of the large bowel with bacteria which are safe to their host begins. The follicles increase steadily in number to a maximum of two hundred at about fifteen to twenty years of age and decline back to about one hundred by thirty years of age and decline further, even to disappearance, throughout the rest of life. The peak incidence of acute appendicitis coincides very well with the peak number of lymphoid follicles and their enlargement with infection, whether it be initially viral or bacterial, probably contributes significantly to the luminal obstruction29 so important in the initiation of acute appendicitis. In the past decade we have increased our knowledge considerably of the cells lining the gastrointestinal tract, especially in the small bowel and ileocaecal region, where new hormones and their functions have been discovered and so have received a lot of attention in appropriate journals. Clarification of B-lymphocyte induction9,13,26 and topography of the cells in foetal and neonatal appendiceal tissues is awaited with interest. In summary therefore, the human vermiform appendix appears to be a complex and organised structure both in its development and maturation, and almost certainly has corresponding complexity in its functions which, like most gastrointestinal functions, are still awaiting further clarification. It would appear that the functions of the appendix would be most important when the organ itself has most prominence, and this is in the developing foetus and early existence after birth. The inside of the bowel is outside the body and the area where substances foreign to it have their greatest chance of attack. The appendix appears to be strategically placed and structurally composed of tissues which are vital in establishing and maintaining the various types of body defences or immunity necessary in recognition of such assaults and having a part to play in their repulsion. The appendix is thus one of the guardians of the internal environment of the body from the hostile external environment. The vermiform appendix occurs only in a few diverse mammals.10 This supports the view that among animal kinds with respect to the occurrence of such a particular and specialised feature one sees mosaicism in its distribution with discontinuity between animal kinds. A careful assessment of the embryology of the appendix in humans indicates that quantitatively it has a very early and rapid development during the critical stages of bowel growth and organisation. However, microscopically the tissues of the appendix are complicated and highly specialised, but this qualitative aspect of the organ’s growth does not occur until just after birth when the neonate takes on essential bacteria to reside in its colon. The appendix would appear to have a role (although not as the sole organ) in establishing and maintaining the bowel-blood barrier for such bacteria in its area. The special aspects of the mucus produced in this area (the antibacterial paint-like action) along with the appendix figuring in the development of its region have been discussed. It has also been shown that the appendix can in no way be vestigial in an evolutionary sense. The hallmarks of the appendix thus appear to be creative design and organisation as if it is formed according to a plan to play a specific purpose. If one studies any organ or organism in the living world, one comes across such a discontinuous and mosaic distribution of structural and functional features among animal kinds. The features for structure and function go hand in glove with each other, obeying sound principles of design engineering and organisation yet possessing incredible functional capacities. Notwithstanding such features, there is also an economy of effort to achieve them and within the system an inherent beauty. Such studies speak of an all-wise Great Architect having dominion over His every creation, be it big or small, fat or thin, so that no one can deny we are ‘fearfully and wonderfully made’. Williams, G.R., 1983. A history of appendicitis. Ann. Surg. 197:495f. Glover, J.W., 1984. The appendix revisited. Proceedings of the Provincial Surgeons of Australia 20th A.G.M., pp. 1–5. Maingot, R., 1974. Abdominal Operations, Appleton-Century- Crofts, 6th edition, Vol. 2, p. 1350f. Schwartz, S., 1984. Principles of Surgery, McGraw-Hill, fourth edition, p.1245f. Burkitt, D.P., 1971. The aetiology of appendicitis. Br. J. Surg., 58:695f. Kelly, H.A. and Hurdon, E., 1905. The Vermiform Appendix and Its Diseases, W. B. Saunders, Philadelphia. Williams, P.L. and Warwick, R., 1980. Gray’s Anatomy, Churchill Livingstone, 36th edition. Berry, R.J.A., 1900. The true caecal apex, or the vermiform appendix: Its minute and comparative anatomy. J. of Anat. and Physiol. 35:83f. Darwin, C., 1871. The Descent of Man, J. Murray, London; esp. pp. 17–33. Ruse, M., 1982. Darwinism Defended, Addison-Wesley. Wheater, P.R., Burkitt, H.G. and Daniels, V.G., 1982. Functional Histology: A Text and Colour Atlas, Churchill Livingstone. ELBS edition. Tome, V.A. and Retief, F.P., 1978. Human vermiform appendix, Immunocompetent cell topography and cell to cell interactions in situ. J. of Immunolog. Methods 20:333f. Wilson, E.O., Eisner, T., Briggs, W.R., Dickerson, R.E., Metzenberg, R.L., O.Brien. R.D., Susman, M. and Boggs, W.E., 1978. Life on Earth—Biology Text, second edition. Return to text. Curtis. H., 1984. Biology, Worth, fourth edition. Kavanagh, M., 1983. A Complete Guide to Monkeys, Apes and Other Primates, Cape. Denton, M., 1985. Evolution: A Theory in Crisis, Burnett, London. Parker, G., 1980. Creation: Facts of Life, Creation-Life Publishers, San Diego. Sleisenger. M.H. and Fordtran. 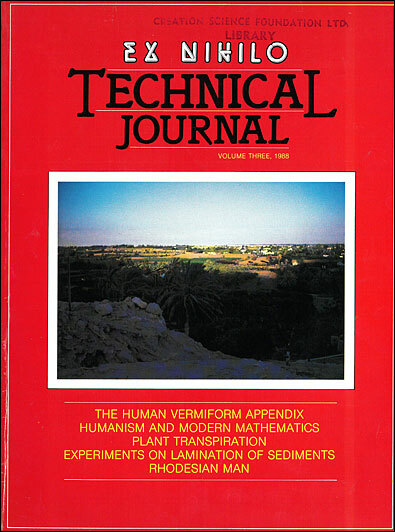 J.S., 1983. Gastrointestinal Disease. Saunders, third edition, p.1268f. Way, L.W., 1985. Current Surgical Diagnosis and Treatment, Lange. 7th edition. England. M.A.. 1983. A Colour Atlas of Life Before Birth. Wolfe Med. Chadwick. V.S. and Phillips. S., 1982. Small Intestine B.I.M.R. Gastroenterology 2. Butterworth. Alexander-Williams. I. and Binder. H.I., 1983. Large Intestine B.I.M.R. Gastroenterology 3. Butterworth. Doe. W., 1986. Immunology of the gastrointestinal tract. Medicine International 2:1044f. Perey. D. Y., Cooper. M.D. and Good. R.A.. 1968. The mammalian homologue of the avian Bursa of Fabricius. Surgery 64:614f. Sussdorf. D.M. and Draper. L.R.. 1956. Antibodies in rabbits after irradiation; shielding the appendix. J. of Infect. Dis. 99:129f. Archer. O.K.. Sutherland. D.R. and Good. R.A.. 1963. The appendix in rabbits after neonatal thymectomy. Nature 200:337f. Wangensteen. O.H. and Dennis. C.. 1939. Experimental proof of the obstructive origin of appendicitis in man. Ann. Sorg. 110:629. Return to text. The Latin word ‘addendum’ means an addition. The Latin word ‘appendix, appendicis f.’ means an appendage -an addition at the end (of a book for example), being an addition almost as an afterthought and not regarded as of great value to the overall theme of the topic at hand. Thus whereas the choice of the adjective ‘vermiform’, meaning worm-like, is accurately descriptive of the organ, the choice of the noun ‘appendix’ from the beginning of the organ’s nomenclature, gave it little chance of ever being considered important. Leonardo da Vinci clearly depicted the organ in his anatomical drawings. Berengario DaCarpi first described the organ. Vido Vidius first named the worm-like organ as the vermiform appendix. Lorenz Heister gave the first good description of a case of acute appendicitis—a post mortem on an executed criminal. Claudius Amyand performed the first recorded successful appendicectomy -the appendix, perforated by a pin, and surrounding omentum were removed through a scrotal wound while dealing with a faecal fistula in a chronic hernia in an 11-year-old boy. John Hunter described a gangrenous appendix at post mortem. John Parkinson first described a faecolith in a perforated appendix at post mortem. François Melier suggested the possibility of appendicectomy as an operation. Dupuytren opposed this view. Bright and Addison published a medical textbook clearly outlining the symptomatology of acute appendicitis. Hodgkin agreed. Joseph Lister gave his first paper on ‘Antisepsis’. Lawson Tait operated with the express intent of performing appendicectomy having made a pre-operative diagnosis of disease of the organ. Abraham Groves of Ontario did likewise. Mikulicz in Krakow recommended and performed surgery for appendicitis. Kronlein in Germany did likewise. Charter Symonds, an Englishman, performed the first interval operation for appendicitis but did not remove the appendix. Hall of New York in May performed appendicectomy but had not commenced the operation with such an intent. Sir Frederick Treves of London unkinked an appendix in February of that year. Morton, seven years after Tait in England and four years after Groves in Canada, in April of that year performed the first deliberated appendicectomy for appendicitis in the United States. Treves recommended interval appendicectomy in September of that year. Sands in December of that year removed an appendix, thus following what he had been preaching for some time. onwards for a decade brought improvement of technique—Treves, Senn, McBurney, Weir, Worcester, Fowler, Deaver, Marcy and Richardson. When—June 18, 1886, at the first meeting of the Association of American Physicians. With the likes of Sternberg, Welch and Osler. What—the first good description of perityphlitis and iliac passion was given. By—Reginald Heber Fitz who was Shattuck Professor of Pathological Anatomy at Harvard University. R.H. Fitz read a paper entitled ‘Perforating Inflammation on the Vermiform Appendix with Special Reference to its Early Diagnosis and Treatment’. He had been a pupil of Virchow, and being a pathologist gave a detailed description of the pathology of the condition. He used the term ‘acute appendicitis’ which mixes a Latin root ‘appendix, appendicis f.’ and the Greek suffix ‘-itis’ implying inflammation and recommended early surgery removal as treatment. He is also noted for a very good paper in 1889 on ‘Pancreatitis’. June—McArthur was to speak on a muscle-splitting incision but the meeting went over time and he did not present his paper. July—McBurney outlined the grid-iron incision and named his ‘point’. Oschner and Sherren suggested a conservative regime to prevent infection spreading making subsequent surgery safer. Murphy reported 2.000 appendicectomies between 1880 and 1903 mostly being what we call interval appendicectomies and named his triad (pain, vomiting and R.I.F. tenderness). Rockey described a transverse skin incision which Elliot had done in 1896. Davis, Harrington, Weir and Fowler all wrote on appendicectomy and incisions. Among famous American surgeons of the time, Ephraim McDowell died of the disease, as did Fowler, whereas Wangensteen survived. Walter Reid died of the disease. Harvey Gushing, the father of modern neurosurgery, survived and Halsted was his surgeon. Sir Frederick Treves was ‘The Elephant Man’s surgeon. In 1902 he operated on Edward VII for an acute appendicitis with abscess the very day before the King (as successor to his mother Queen Victoria, who died in 1901) was to have his coronation. The coronation, of course, had to be postponed. Treves performed the first unkinking of the appendix operation (1887) and in England and Europe was known as a proponent for interval appendicectomy (also 1887). He described the bloodless fold as part of the mesentery of the appendix, wrote on the positions or the appendix around the caecal apex according to a clock race, and also wrote on the types or caecum to which the appendix was attached. His own daughter died of acute appendicitis. Williams. G.R., 1983. A history or appendicitis. Ann. Surg. 197:495f. Return to text. Kelly. H.A. and Hurdon. E., 1905. The Vermiform Appendix and Its Diseases. W.B. Saunders, Philadelphia. Return to text. Shepherd. J.A., 1960. Surgery of the Acute Abdomen. E. & S. Livingston Ltd. p. 401f. Return to text. Seal. A., 1981. Appendicitis: a historical review. Canadian J. Surg. 24(4):427f. Return to text. Maingol. R., 1974. Abdominal Operations. Applelon-Century-Crofts, 6th edition. 2:1370 f. Return to text.